Planning your spring break? Whether it’s gonna be a whole week of holidays or just a long weekend around Easter, spring is a wonderful time to travel. I have asked fellow travel bloggers what their favourite spring destination is, but I had one condition – it should be not touristy and still full of charm. This is how I came up with this list of 7 less touristy places to visit this spring. You can choose to escape to a warmer place, but I think that spring has to be admired with the things that make it so special – the nature that’s waking up, flowers everywhere, trees in blossom with the first pale green leaves that are just budding, the air that’s crisp and fresh, and those shy sun rays, so impatient to warm up the ground. It’s all about nature and escaping the crowds! 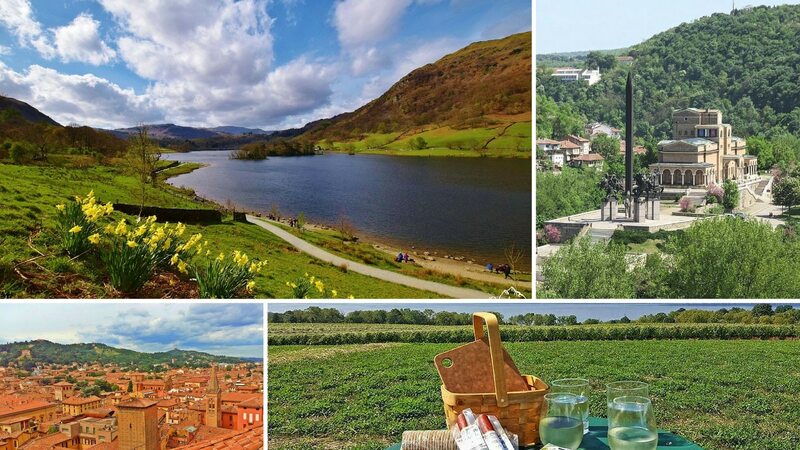 Read: 15 cool ideas for an Easter weekend in Europe. The Lake District National Park in the UK is a wonderful place to visit at any time of year. But the great thing about visiting in the spring is you’ll get to see the gorgeous spring flowers. Bright bluebells popping up in the wooded areas and displays of sunshine yellow daffodils everywhere. One place that you should see lots of bluebells is in White Moss Walks. In between, the villages of Grasmere and Ambleside there’s a small parking area which leads you directly into a wooded area. And if you continue walking you’ll reach Rydal Water which is lovely to walk beside on a warm spring day. There are plenty of daffodils bursting through the ground to and even the Rydal Caves that you can explore (no flowers in here though!). In the lovely village of Grasmere, you can try some amazing gingerbread! This is also where you will find the graves of the famous poet William Wordsworth and in early spring the ‘The Wordsworth Daffodil Garden’ is a splash of yellow. Along with the flowers, there are some wonderful short and long hikes that you can do in the Lake District and with nature blooming, spring is a wonderful time to visit. I spent a long weekend camping in the Lake District and you can read more about my trip here. As Madeira, a Portuguese archipelago, is often nicknamed ‘The Island of Eternal Spring’, I couldn’t think of any other travel destination that is perfectly formed for a Spring adventure. What gives this beautiful island its nickname is the fact that it has a Spring-like climate all year round, with temperatures at a pleasant 16°C in the coldest month (January) and 23°C in the hottest month (August). This means embarking on hiking trails, dolphin watching and coach tours are all done during pleasant, comfortable temperatures and with plenty of hours of sunshine. Madeira is an island that has been formed out of volcanic rock making the landscape lush with vegetation. It is home to interesting attractions such as volcanic rock pools, botanical gardens and beautiful scenery, making this island perfect for nature lovers. As Madeira is so ripe with vegetation, hikes around the island are incredible as you will see lots of species of plants, flowers and wildlife. So when travelling around, ensure you keep your eyes peeled all around you! I genuinely can’t think of a more perfect trip to embark on during the spring months than a week (or two) in Madeira. You’ll get plenty of opportunity to relax by your hotel pool in the sun, whilst embarking on epic hikes and seeing plenty of nature in amongst your relaxed days. About the author: Justine Cross is the Founder of the female travel blog Wanderer of the World, which is aimed at inspiring other women to get out and explore new destinations – whether for the first time, or the tenth time. Kenting is most likely not on your radar unless you live in or have traveled around Taiwan. It doesn’t even really sound​ like a city in Taiwan, yet there it sits, at the southern tip of the country. Kenting is known domestically as the beach getaway, the fertile crescent of Formosa, and a natural wonderland. The city could honestly be a year-round destination, but the massive summer crowds and rather cool winter weather make the stand-out seasons spring and fall. Known as shoulder season, spring in particular brings blooming flowers and budding trees, ripe with peaches and plums. Pingtung County, where Kenting is located, is known for their vast amounts of pineapple and late spring mango, as well as their cacao trees— the raw material used to make chocolate. Temperatures in Kenting hover consistently in the upper 20’s Celcius thanks to the island’s sub-tropical climate. Surfing, scuba diving, and stand-up paddle boarding attract a small number of international visitors, but most of the people in town during the spring will be locals. If you visit Kenting from March to May, you’ll find fresh fruits, cheap vacation rentals, and an island paradise nearly all to yourself. There’s even a local international airport, for those not coming from elsewhere in Taiwan. For those already on the island, consider taking the bullet train down from Taipei or Taichung, and thank me later. Some of the attractions beyond the miles of coastline include Kenting Street’s nightly market, Uncle A-Shin’s Cacao Farm, and Kenting National Park. About the author: Max ​Gandy​ is a chocolate aficionado living in South Korea, and the explorer behind Dame Cacao. She enjoys wine on the beach and revels in feeling familiar in the widely unknown. Spring in Southern Italy is colorful and warm. By the end of May, you can even sunbath and you should pack sunscreen and your sunglasses. Puglia (Apulia, Eng) is a region in Southern Italy that borders the Adriatic Sea to the east and the Ionian Sea to the south-east. Across the Adriatic Sea, it borders Greece, Montenegro, Croatia, Albania, and Bosnia-Herzegovina. While summers can be scorching hot, spring offers the best time to explore the region. There are a lot of hiking trails through the region, ranging from easy to moderate. Just make sure to pack good walking shoes (I favor all terrains), a water bottle, sunscreen, sunglasses, and a bandana or hat. For my wedding anniversary in 2016, I’ve done a hike combined with a unique experience: a lunch at a trattoria near Vieste, up on the Gargano Coast. Food plays an important role in the area. Known as “cucina povera” (the cuisine of the masses), it is based on simple ingredients such as olive oil, local cheeses, and vegetables. Enjoying a lunch at a trattoria is an interesting experience but be prepared to eat a lot or explain that you just cannot eat that much (it took us a lot of explanation why we cannot go past the antipasti). Choose Bari as your base as it is home to a well-connected airport. It also has train and bus connections to the rest of Italy. If you have only a limited time in the area, do not miss a visit to Alberobello, which can be done as a day trip from Bari. If you are looking for sunbathing, then the Gargano Coast is a perfect choice being dotted with resorts (Vieste, Peschici, etc). An interesting choice can be Salento, located at the heel of the Peninsula, while Ostuni, Otranto and Poligano a Mare provide the photos just perfect for your Instagram account. About the author: Cris is a travel writer who has fallen in love with the Mediterranean countries. She loves to explore off-the-beaten path areas and talk about her discoveries on her blog. After the bitter winds and freezing snowstorms of winter, the Finger Lakes region in upstate New York comes alive with the sights, smells and flavors of spring. As the green returns to the trees and flowers begin to bloom, the freshness in the air will captivate you. In addition to a blossoming wine scene and beautiful hiking trails along cascading waterfalls, visitors can also experience fresh farm to table foods with produce, meats and cheeses fresh from the local Amish communities. There is also an emerging craft brewing scene with new breweries popping up everywhere. Although some of the larger wineries and parks can get busy from time to time, there are countless of new destinations popping up every year. And with hundreds of miles of coast line between the 11 lakes, there are more than enough beautiful views to go around. For us, nothing beats sitting down to a few glasses of wine with local artisan meats and cheeses while taking in the cool breeze overlooking rolling vineyards with cool blue waters in the distance. Sometimes just turning down one of the beautiful local roads and seeing where it leads can bring the most rewarding experiences. If you love water based activities, the massive glacial carved lakes are perfect for a warm afternoon. At the end of the day, you can head to Ithaca at the foot of Cayuga lake. Home to Cornell University and Ithaca College, the city maintains a strong hippy and DIY vibe with plenty of fresh and delicious restaurants. If you want a bit of a quieter scene, the lakes are ringed with charming small towns with excellent food and drinks to be discovered. Whether you are a nature lover and outdoor enthusiast, or someone one loves delicious food and drink, make sure to include the Finger Lakes Region in your plans for Spring 2018! About the authors: Tara and Dan are the creative writers behind ‘Nutrition Abroad’, a website that offers travel advice and guides for budget travelers as well as recipes from around the world. Originally from Upstate NY, the couple have been living in Thailand for the past 6 years, and are currently traveling the world for one year. Follow Nutrition Abroad on Instagram. Bologna is a wonderful and authentic Italian city. I’ve ended up there after a 10-days trip in The Netherlands and I just loved it. When I visited Bologna the weather was perfect and overall, Bologna was the perfect spring destination. There are many reasons to visit and fall in love with Bologna. The city is the capital and largest city in the Emilia-Romagna region. Emilia-Romagna is one of the most developed regions in Europe and home to the oldest university in the word. Bologna and the whole region are well-known for their amazing food and wine production – you shouldn’t miss that! Also, the region is so well connected that you should visit at least one more place in the area. About the author: Bilyana is a travel blogger, mountain lover and a full-time dream chaser. She shares her adventures and experiences around the world to inspire you to travel more & worry less and to get out of your comfort zone. I love visiting Veliko Tarnovo in spring! Everything is so green and the river gets wild with the melting snow in the mountains! Veliko Tarnovo is a picturesque city in North Bulgaria built on the hills around which the Yantra River meanders. It has a rich cultural and historical heritage, as it was capital of Bulgaria in the Middle Ages. Today, there isn’t much left of this glorious past, but there is still one castle that has remained to remind us of those days – the Tsarevets Fortress. Veliko Tarnovo will be perfect destination for a long Easter weekend. The city is beautifully decorated and you can take part in one of the Easter Vigils at midnight and walk out of the church with a candle in your hands trying to keep the light on all the way back to your hotel. Just bear in mind that the Orthodox Easter is on a different day than the Western One. Spring is all about festivities in Veliko Tarnovo. The annual city celebrations are on 22 March, which is the Day of Veliko Tarnovo. There is a lot of entertainment going on and there are various events happening all week long. The most special one is the famous 3D and light show with lasers and fireworks, projected on the façade of the State Art Museum (on the photo). A lot of Bulgarians come to Veliko Tarnovo for the celebrations, so if you decide to visit the city around 22 March, book your accommodation well in advance. If you are into nature and hiking, you won’t be disappointed either. There are numerous hiking trails that start from the city, as well as a few forest parks outside of the city, where you can go for a walk. You can get easily to Veliko Tarnovo from Sofia – it’s only a 3 hours bus ride. I won’t recommend taking the train, unless you are travelling exclusively by train, as it’s slower and there’s no direct connection with Sofia. About the author (well that’s me): You probably know already that my name is Daniela. I love to travel to less-known places, to visit off-the-beaten path destinations. I hope I can inspire you to explore the less travelled places in this world, but please, travel responsibly and respect the local culture and traditions! If you want to travel as much as possible, but have a 5 to 9 job, you should seize each opportunity. Public holidays are a great opportunity and there are quite a lot of them in springtime (at least in Europe). Another way is to take long weekends to nearby places. I normally travel during the Easter holidays and here are some of my recommendations for a 4-day long weekend getaway with things to do and places to visit. Most of those places I have actually visited during the Easter weekend. 4 days in Wallonia (Belgium). Have you already made your plans? Let me know which place you have visited this spring (or are planning to visit) and what is so special about it? Maybe you can inspire me for my next Easter holiday trip, as I haven’t made up my mind yet where to go this spring… I know, I know, I try to inspire you and at the same time I am looking for travel inspiration… Any suggestions? I think there are some great ones above, or not. I just love the Lake District, I just wonder if the crowds are going to really increase now that it has been named a UNESCO heritage site. I hope not! That’s always the question. I hope this status will help for the preservation of this place, but on the other hand will make it more popular. These look beautiful! I love shoulder season travel for the perfect weather, smaller crowds and lower prices 🙂 We’ll be visiting Japan and Israel this spring! I love travelling out of season – what you lack in weather or facilities you more than make up for in peace and quiet! Must check some of these out! Great article! I am actually heading to Madeira in the spring, so I was happy to see it in the list!